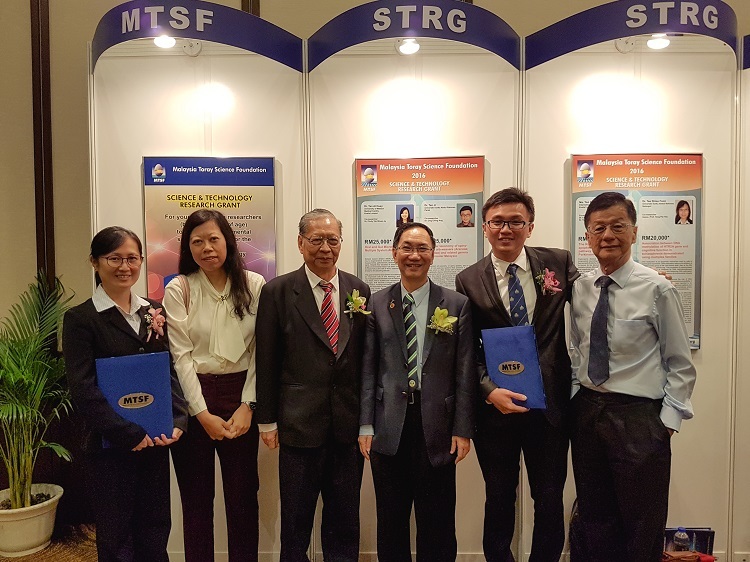 Researchers Dr Tee Shiau Foon from the Department of Chemical Engineering, Lee Kong Chian Faculty of Engineering and Science (LKC FES) and Dr Tan Ji from the Department of Agriculture and Food Science, Faculty of Science (FSc) each received a Year 2016 Malaysia Toray Science Foundation (MTSF) Science & Technology Research Grant at the InterContinental Hotel, Kuala Lumpur on 6 December 2016. Funded by the Toray Science Foundation, Japan, Dr Tee and Dr Tan received the grants that carry RM20,000 and RM25,000 respectively. They will fund Dr Tee and Dr Tan’s research projects respectively titled “Association between DNA methylation of HTR24 gene and cognitive function in schizophrenia demonstrated using multiplex families” and “Molecular taxonomy of spiny-backed orb-weavers (Araneae; Araneidae) and related genera in Peninsular Malaysia”. 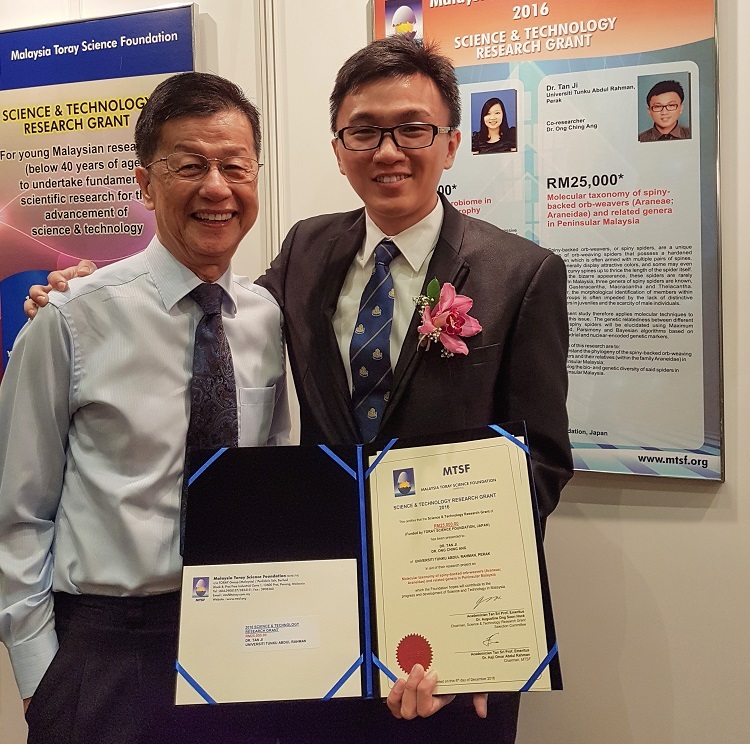 “I would like to thank my research collaborator Dr Tang Pek Yee, family members and the love of my life because I could not have achieved this without their endless support and encouragement,” Dr Tee said. Dr Tee’s research aimed to determine the role DNA methylation of the HTR2A gene plays in schizophrenia susceptibility. It has been reported to be upregulated in the brain or platelets of schizophrenic patients and has a central role in the circuitry of cognition and emotions, where the psychobiological domains are usually altered by schizophrenia. “I feel very lucky and privileged to be able to receive this grant considering the huge spike in applications this year. I also feel grateful to my co-supervisor Dr Ong Ching Ang and my mentors for their valuable advice and guidance,” Dr Tan said. “My study focuses on a unique group of spiders in Malaysia known as spiny spiders. These spiders possess long and pointed spines on their abdomen and are often strikingly coloured. The study will apply the genetic data obtained to better understand the evolutionary relatedness of various species of spiny spiders within the region,” Dr Tan said. “I also hope that the results of this grant would encourage more people to learn and better understand spiders, which may eventually lead to greater discoveries in our time,” he continued.